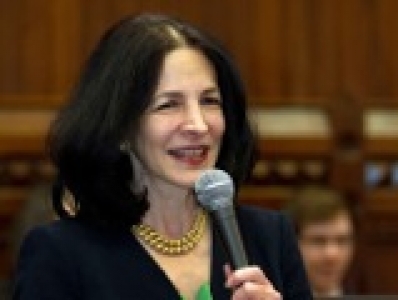 State Representative Gail Lavielle (R-143) has been endorsed by the bipartisan Connecticut League of Conservation Voters (CTLCV) for reelection on November 4 to the General Assembly's 143rd House district, which includes parts of Norwalk, Westport, and Wilton. The endorsement comes shortly after CTLCV's announcement that, for the third consecutive year, it had named Rep. Lavielle one of its 16 designated "Environmental Champions" for the 2014 legislative session. (See Page 19 of the CTLCV 2014 Environmental Scorecard – click here). "Representative Lavielle has been a reliable champion of the environment since she first set foot in the Capitol," said Lori Brown, Executive Director of the CTLCV. "She has a real commitment to our core values that we count on from members on both sides of the aisle, and represents the kind of legislator we support and want to see more of in Hartford." The CTLCV, a bipartisan, statewide, nonprofit organization, endorses candidates for the state legislature based on their positions and track record on environmental issues. They must be committed to protecting Connecticut's land, water, air, and wildlife, and to working for sustainable solutions to pressing state issues like transportation, energy, and waste management. Lavielle has been a vocal proponent and advocate of legislation supporting the development and modernization of Connecticut's transportation infrastructure and improvement of mass transit, and was recognized by the CTLCV in both 2013 and 2014 for her leadership in transportation. She introduced legislation that will facilitate brownfield remediation, and co-sponsored legislation that will increase protections for land set aside by the state for conservation. Other legislation she has supported includes bills that will require labeling of food produced with genetic engineering (GMO); provide incentives to water companies to invest in conservation and infrastructure improvements to ensure water quality; require the creation of a state water plan; clarify the rights and roles of utilities and property owners in tree trimming decisions; and ensure sound coastal management practices. "The CTLCV does an excellent job of helping us make environmental stewardship a legislative priority," said Lavielle, "and I am honored by its endorsement. I will continue to support legislation that preserves and protects our environment and our natural resources, while remaining attentive to ensuring that these initiatives are undertaken within a framework of sound fiscal discipline. I'm grateful to the CTLCV for being such a valuable, active partner in helping legislators develop sound environmental policy." State Rep. Gail Lavielle represents Wilton, Norwalk, and Westport. She is Ranking Member of the General Assembly's Commerce Committee and the Appropriations Committee's Subcommittee on Transportation. She is also a member of the Appropriations, Education, and Higher Education Committees, as well as the bipartisan Long Island Sound caucus.